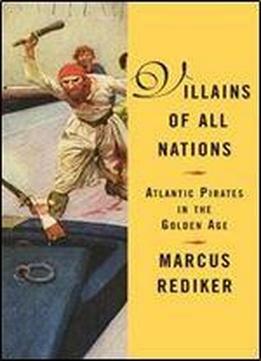 Villains of All Nations explores the 'Golden Age' of Atlantic piracy (1716-1726) and the infamous generation whose images underlie our modern, romanticized view of pirates. Rediker introduces us to the dreaded black flag, the Jolly Roger swashbuckling figures such as Edward Teach, better known as Blackbeard and the unnamed, unlimbed pirate who was likely Robert Louis Stevenson's model for Long John Silver in Treasure Island. This history shows from the bottom up how sailors emerged from deadly working conditions on merchant and naval ships, turned pirate, and created a starkly different reality aboard their own ships, electing their officers, dividing their booty equitably, and maintaining a multinational social order. The real lives of this motley crew-which included cross-dressing women, people of color, and the'outcasts of all nations'-are far more compelling than contemporary myth.